In a stern message to Pakistan that India would brook no interference in its internal affairs, New Delhi today called off the August 25 talks between the Foreign Secretaries of the two countries in Islamabad. Upset over Islamabad setting in motion the process of consultations with Kashmiri separatist leaders ahead of crucial talks, Foreign Secretary Sujatha Singh told Pakistan High Commissioner Abdul Basit that the neighbouring country’s continued efforts to interfere in India’s internal affairs were ‘unacceptable’. The Foreign Secretary also told the Pakistani envoy that his meetings with Hurriyat leaders undermined the constructive diplomatic engagement initiated by Prime Minister Modi on his very first day in office in May. It was made clear to Islamabad that the only path available to it was to resolve outstanding issues through a peaceful bilateral dialogue within the framework of the Simla Agreement and the Lahore Declaration. Under the present circumstances, it was felt in New Delhi that no useful purpose would be served by the Foreign Secretary’s visit to Islamabad next week. 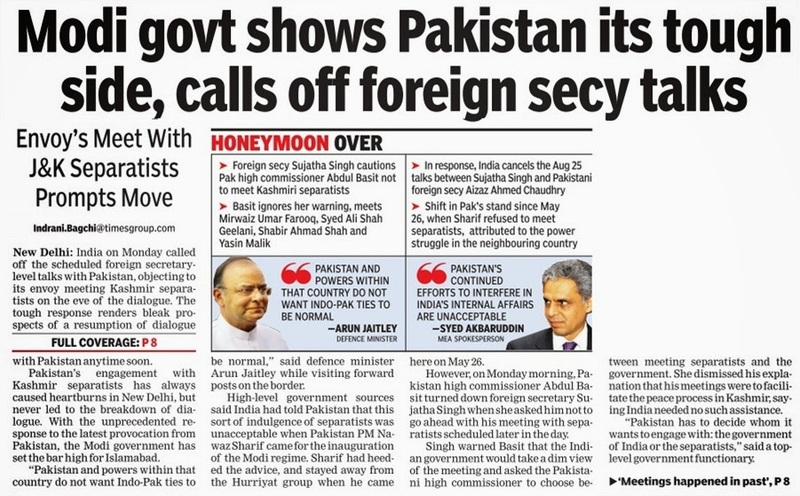 Official sources said the Foreign Secretary told the Pakistani envoy to refrain from engaging with Hurriyat leaders as such a move would indeed not go down well with New Delhi. 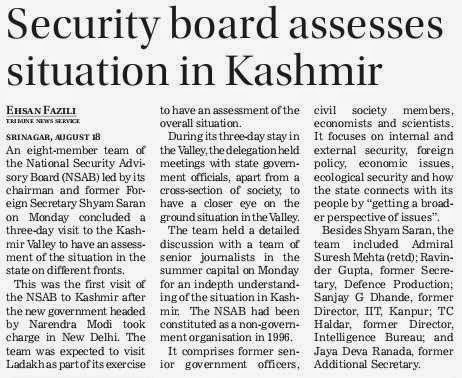 It was only after Basit had met Kashmiri separatist leader Shabbir Shah that India announced the cancellation of the talks. The move to call off talks is being seen in diplomatic circles as a major departure from the past when the previous UPA government chose to ignore such provocative steps by Islamabad on many occasions. 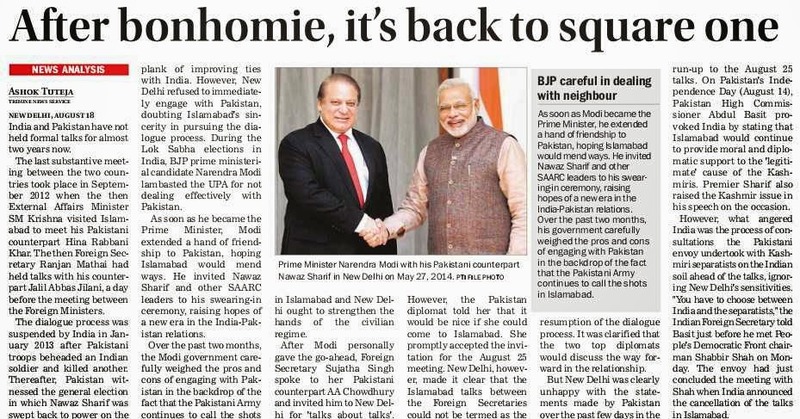 PM Modi is learnt to have taken a serious view of Islamabad holding parleys with the separatists at a time when he himself was keenly looking forward to the resumption of dialogue between the two countries. 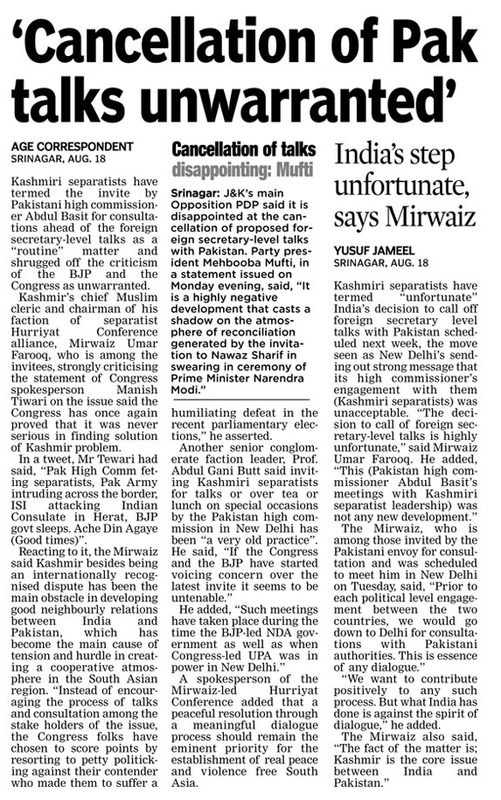 Yesterday, the Congress had questioned the ‘muscular’ foreign policy of the Modi government in the backdrop of Islamabad holding talks with separatists. Pakistan Foreign office, meanwhile, termed the decision to call off talks a setback for the bilateral ties. 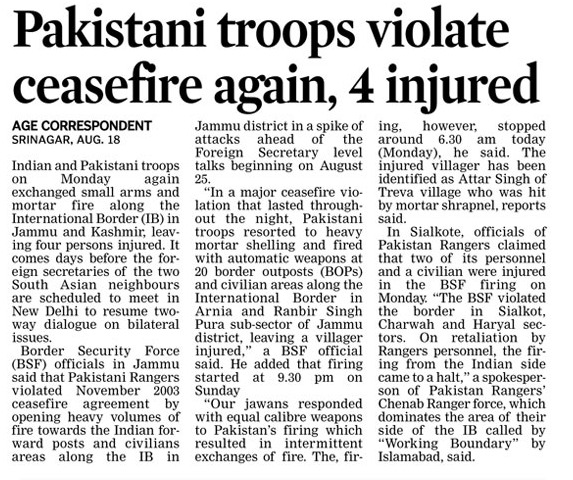 Pakistan Rangers on Sunday night shelled 20 forward Indian posts and civilian areas along the International Border in Jammu sector, leaving a villager injured. The shelling continued till Monday morning. 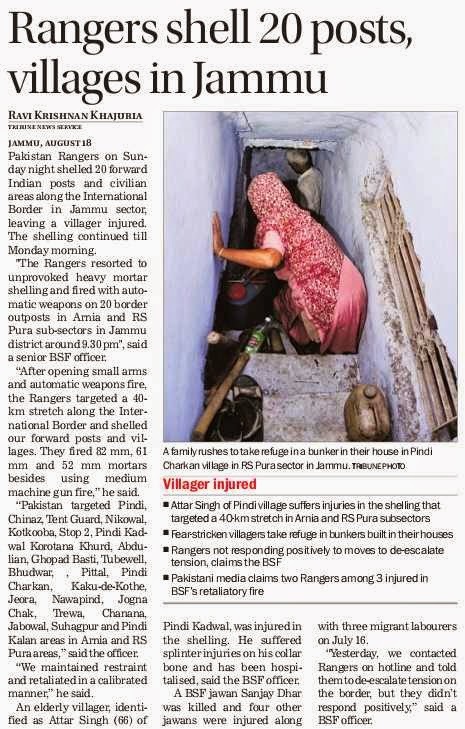 "The Rangers resorted to unprovoked heavy mortar shelling and fired with automatic weapons on 20 border outposts in Arnia and RS Pura sub-sectors in Jammu district around 9.30 pm", said a senior BSF officer. “After opening small arms and automatic weapons fire, the Rangers targeted a 40-km stretch along the International Border and shelled our forward posts and villages. They fired 82 mm, 61 mm and 52 mm mortars besides using medium machine gun fire,” he said. “Pakistan targeted Pindi, Chinaz, Tent Guard, Nikowal, Kotkooba, Stop 2, Pindi Kadwal Korotana Khurd, Abdulian, Ghopad Basti, Tubewell, Bhudwar, , Pittal, Pindi Charkan, Kaku-de-Kothe, Jeora, Nawapind, Jogna Chak, Trewa, Chanana, Jabowal, Suhagpur and Pindi Kalan areas in Arnia and RS Pura areas,” said the officer. 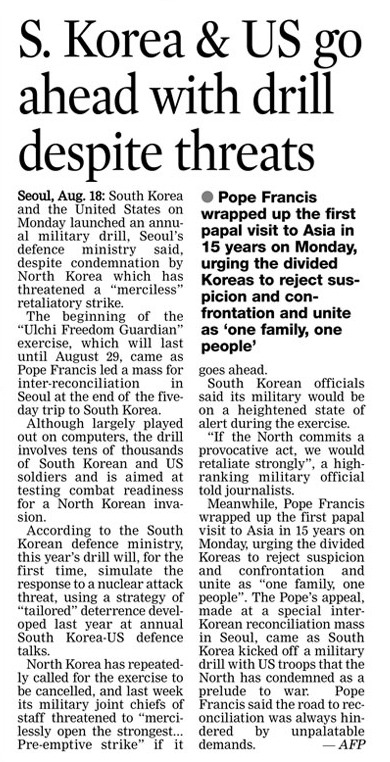 “We maintained restraint and retaliated in a calibrated manner,” he said. An elderly villager, identified as Attar Singh (66) of Pindi Kadwal, was injured in the shelling. He suffered splinter injuries on his collar bone and has been hospitalised, said the BSF officer. A BSF jawan Sanjay Dhar was killed and four other jawans were injured along with three migrant labourers on July 16. 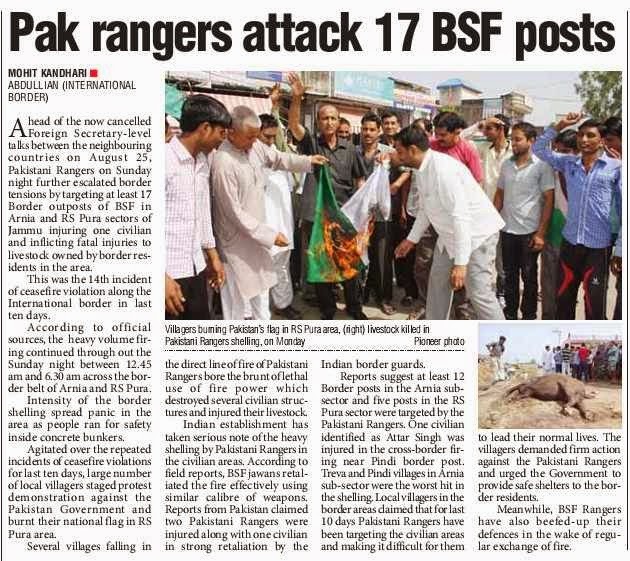 “Yesterday, we contacted Rangers on hotline and told them to de-escalate tension on the border, but they didn’t respond positively,” said a BSF officer. 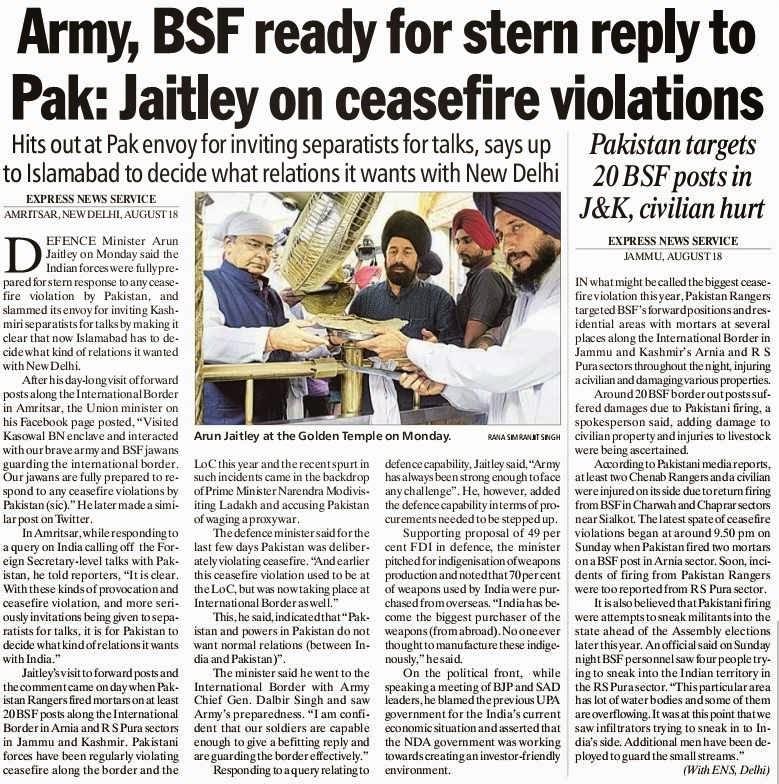 In a stern message to Pakistan, Defence Minister Arun Jaitley today said Army jawans were prepared to respond to any ceasefire violation by the neighbouring country in a befitting manner. Talking to mediapersons in Amritsar, he said: “India will not tolerate ceasefire violations at any cost.” Expressing apprehensions over the intentions of Pakistan, he said there were some forces in the neighbouring country which did not want its relations with India to normalise. Referring to ceasefire violations and its invite to separatists for talks, he said it was for Pakistan to decide what kind of relations it wanted with India. Jaitley’s statement comes after heavy mortar shelling by the Pakistan Army along the Indo-Pak border in Jammu. He also stressed on the need to make the country self reliant in weaponry. He said 70 per cent of the weapons needed by Defence were not made in the country. 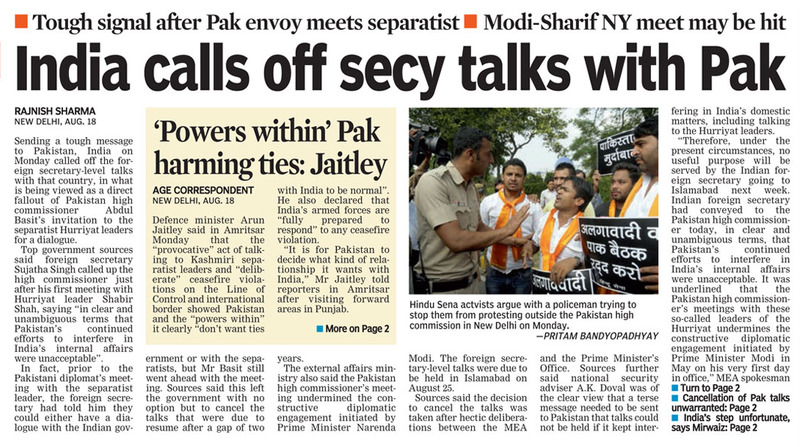 Jaitley was here to interact with Army and BSF troops posted alongside the international border. He visited the headquarters of Panther Division where he was briefed on the overall dynamics of Western sector, including operational preparedness. He also visited forward posts in Dera Baba Nanak and interacted with troops as part of motivation and welfare programme. Army Chief General Dalbir Singh Suhag accompanied him. Later, Chief Minister Parkash Singh Badal and Revenue Minister Bikram Singh Majithia welcomed Jaitley at the Circuit House where he was given the guard of honour. He also paid obeisance at the Golden Temple and Durgiana temple, besides paying tributes to martyrs at the Jallianwalla Bagh. Badal and SGPC chief Avtar Singh Makkar felicitated Jaitley by presenting him a replica of the holy shrine. The Border Security Force (BSF) has handed a list of camps used by North East insurgents to their counterparts in Bangladesh, reports said. 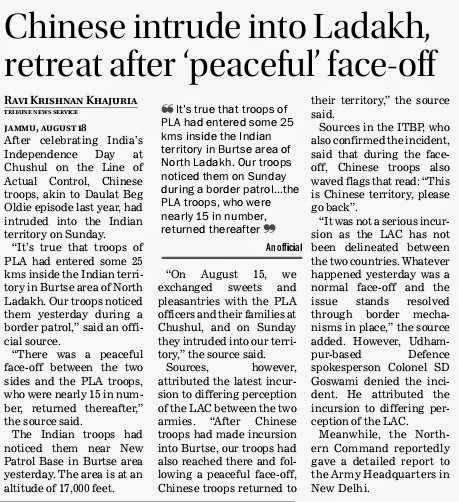 After celebrating India’s Independence Day at Chushul on the Line of Actual Control, Chinese troops, akin to Daulat Beg Oldie episode last year, had intruded into the Indian territory on Sunday. 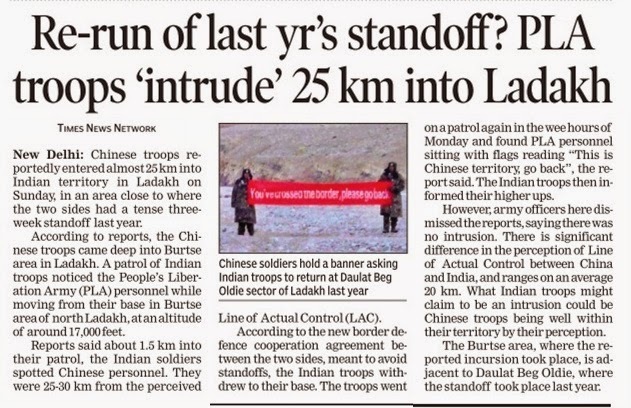 “It’s true that troops of PLA had entered some 25 kms inside the Indian territory in Burtse area of North Ladakh. Our troops noticed them yesterday during a border patrol,” said an official source. “There was a peaceful face-off between the two sides and the PLA troops, who were nearly 15 in number, returned thereafter,” the source said. The Indian troops had noticed them near New Patrol Base in Burtse area yesterday. The area is at an altitude of 17,000 feet. “On August 15, we exchanged sweets and pleasantries with the PLA officers and their families at Chushul, and on Sunday they intruded into our territory,” the source said. Sources, however, attributed the latest incursion to differing perception of the LAC between the two armies. “After Chinese troops had made incursion into Burtse, our troops had also reached there and following a peaceful face-off, Chinese troops returned to their territory,” the source said. 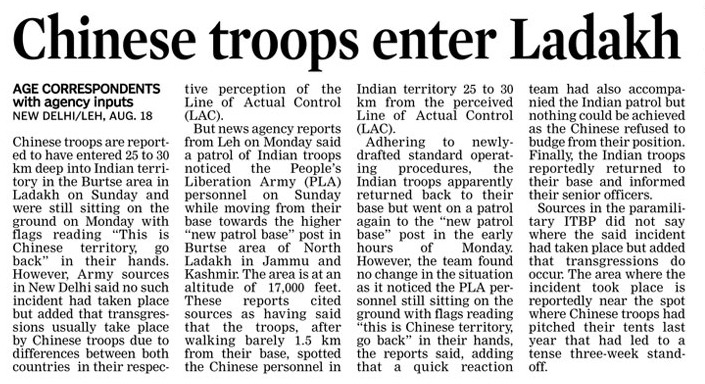 Sources in the ITBP, who also confirmed the incident, said that during the face-off, Chinese troops also waved flags that read: “This is Chinese territory, please go back”. 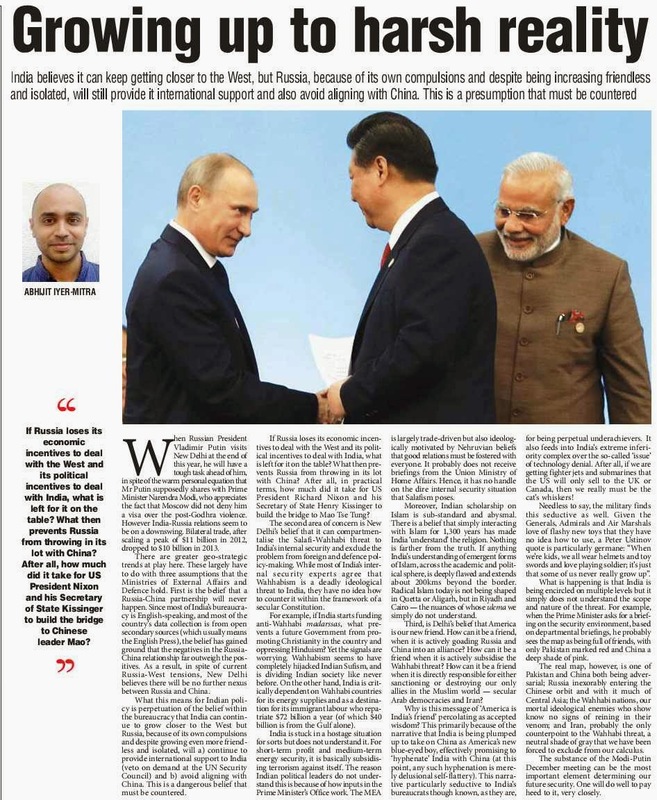 “It was not a serious incursion as the LAC has not been delineated between the two countries. Whatever happened yesterday was a normal face-off and the issue stands resolved through border mechanisms in place,” the source added. However, Udhampur-based Defence spokesperson Colonel SD Goswami denied the incident. He attributed the incursion to differing perception of the LAC. Meanwhile, the Northern Command reportedly gave a detailed report to the Army Headquarters in New Delhi. What was General (retd) VK Singh, the former Indian military chief, actually trying to do? Speculated to have gone to the last limit in his attempts in “nepotising the Indian military”, the general failed and instead, became a politician and a senior leader in today’s BJP-led Indian government. It is very difficult to write about the appointment of the new Indian military chief without mentioning General (retd) VK Singh, who has been the biggest critic of his appointment. General (retd) VK Singh, in 2012, charged the now-appointed Indian military chief with “abdicating responsibility” in an intelligence operation carried out by a unit under his command in the 3 Corps based in Nagaland. General Bikram Singh, his successor, however, revoked the disciplinary action on taking over the Indian military command from him in May 2012. In military jargon, it is called ‘reviewing senior commander’s report’ and ‘expunging the comments’ or altogether discarding the report itself if considered inappropriate and uncalled for. Ideally, such an action is taken by the next commander in the reporting chain of command. But for one military chief to disagree with the opinion of another in matters of reporting on senior generals on assumption of his command is unprecedented. That one army chief disagreed with the findings and report of another army chief speaks of some ‘suspicious motive’ to implicate a senior officer in a ‘botched scandal’ — especially when that senior officer ends up becoming the Indian army chief. The tell-tale signs inform us that General (retd) VK Singh’s younger daughter was married to Southern Army Commander Lt General Ashok Singh’s son, Dr Anirudh. General (retd) VK Singh created a controversy by attempting to prolong his stay in the Indian military chief’s office, claiming his date of birth to be May 10, 1951 instead of May 10, 1950. Had the Indian government accepted his request of 10 months’ service extension, his eventual successor and the next senior officer in line to become the Indian army chief would have been his daughter’s father-in-law. Despite the controversies surrounding General (retd) VK Singh’s last days in office, the former Indian army chief-turned-politician has created history by winning the Ghaziabad seat in the Indian general elections by a margin of more than 567,000 votes. He defeated actor-turned-politician Raj Babbar and journalist-turned-politician Shazia Ilmi, who were contesting against him and who embarrassingly lost their security deposits. General (retd) VK Singh’s victory is the second-highest victory margin in the country after Narendra Modi’s margin in Vadodra. Could a military general, who was found trying to negatively influence the promotion of a fellow military officer, be sent to the Indian parliament through such a resounding victory and get public acclaim for his services to the Indian state? The bottom line is that Prime Minister Modi, today, is a popular politician and a former Indian military chief, who does not approve of the appointment of the current Indian military chief, and the BJP government itself is pretty furious with the Congress for having made the appointment a few days before the end of its tenure. Who, then, is General Dalbir Singh Suhag? After Sam Hormusji Framji Jamshedji Manekshaw (the only Indian soldier to be promoted to the field marshal rank), General Dalbir is the second Gurkha soldier to take over the reins of Indian military command. About Gurkhas, Field Marshal Manekshaw famously remarked, “If a man says he is not afraid of dying, he is either lying or he is a Gurkha.” Like the American General Stanley McChrystal, the current Indian army chief is also a fitness fanatic and reportedly runs 10km every day. Like the former Pakistani military chief, General (retd) Ashfaq Parvez Kayani, he is also from a humble background. His father, Ramohal Singh Suhag, was a subedar in the Indian Army and his previous two generations have also served in junior ranks in the army. When on his first day in office, the new Indian army chief warned Pakistan on the alleged repetition of beheading-like incidents of Indian soldiers, one could not miss the ‘Gurkha tone’ in the language he spoke. The “more than adequate, intense and immediate” future response that the general spoke of reminded me of General Manekshaw and his cavalier military speeches. Being a student of civil-military relations, I fail to understand why the largest democracy in the world fails to rein in its military commander from making policy statements. Unlike in Pakistan, in India, the responsibility of national defence rests with the cabinet (politicians). The defence policy is further discharged through the ministry of defence. The strategy of “immediate and intense military response” becomes ‘non-serious military jargon’ when coming from a military leader speaking on his first day in office. Coming from the person occupying the pinnacle of the Indian political pyramid, such a statement would have made an altogether different meaning. In Pakistan here, we need to keep our fingers crossed. We have a democratic government that is under intense political pressure and faces an existential challenge from an uncompromising and a street-demonstrating opposition. Our army is fighting against terrorists on our western front. It has also been called upon to aid civil power in the capital and may soon find itself doing the same in other major cities. If the politicians fail, the only force that moves to fill in the vacuum is the armed forces. The last thing Pakistanis want is a tough-talking Indian military chief dishing out ‘military threats’ on his first day in office. I hope political masters remain in charge of Pakistan, and also, the politicians in India, who remain in charge of preventing a military chief from implementing a ‘military extravaganza’ that may result in adverse military and political consequences in the region. NEW DELHI — India has removed South Africa’s Denel from a blacklist, allowing the company to again do business here after nine years of investigations failed to prove corruption charges related to a rifle purchase. The Indian Ministry of Defence sent a letter Aug. 12 to Denel lifting the ban, said a source in the MoD. An executive of Denel, who requested not to be named, said they received a communication from MoD saying the ban had been lifted, but gave no details of the contents of the MoD letter. “The decision to de-blacklist Denel and allow it to do business in India will send a positive signal to overseas defense companies to do business in India,” said an executive of an overseas defense major based in New Delhi. Denel was banned by the outgoing United Progressive Alliance (UPA) government after allegations that it paid kickbacks to secure a deal with the Indian Army in 2002 to sell 1,000 NTW-20 anti-material rifles along with 398,000 rounds of ammunition. Under the deal, 700 rifles were to have been purchased directly and the remaining 300 licensed-produced in one of the factories of India’s state-owned Ordnance Factory Board. Only 400 rifles had been inducted into the Indian Army and the remainder put on hold after the 2005 blacklisting and investigation by the anti-fraud agency, the Central Bureau of Investigation (CBI). Charges were filed by the CBI against Denel and the UK-based consulting firm Varas Associates, which allegedly rerouted part of the commission to unnamed officials of Denel and the MoD in India. Varas was not banned along with Denel. None of the charges have been proved by CBI, the MoD said. The purchase of the anti-material rifles was made during the tenure of the National Democratic Alliance (NDA) government, which was in power from 1999-2004, and returned to power in May. The blacklisting was done under the outgoing UPA government within a year of it coming into power in 2004. The blacklisting of Denel stalled several Indian Army projects, including the purchase of 155mm/52 caliber artillery guns as Denel was the front runner in that program, which was then canceled. The blacklisting also delayed the homegrown effort, “Bhim Artillery Project,” under which Denel had proposed to install its 155mm artillery gun on an Indian-made Arjun tank chassis. “Denel will now emerge as a keen competitor in India’s $4 billion variety of 155mm/52 caliber artillery gun projects,” said defense analyst Nitin Mehta, adding that the South African company may forge tie ups with domestic defense companies to compete in these programs. CHANDIGARH: Defence minister Arun Jaitley on Monday visited the forward posts around Dera Baba Nanak area along the International Border (IB) with Pakistan in Amritsar district. "The minister interacted with troops, as part of Army's motivation and welfare program," a press release said. 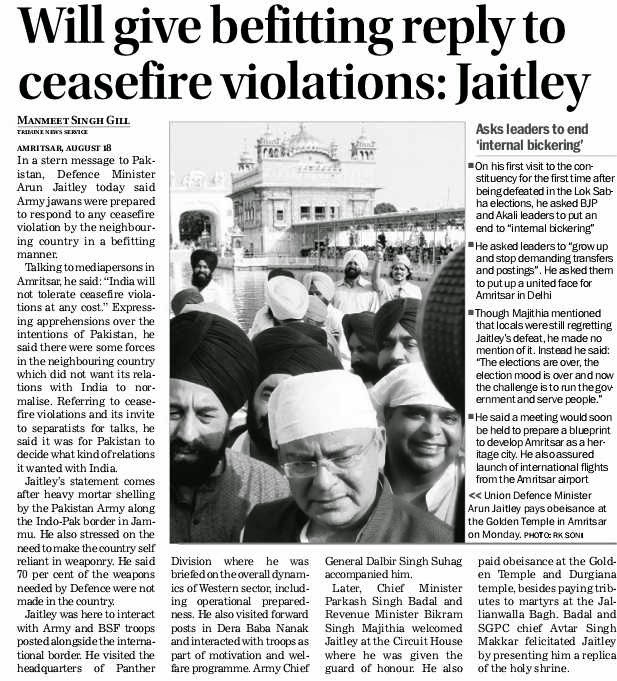 Jaitley is on a day-long visit to Amritsar. He also motivated the troops and announced incentives for those deployed on the forward posts, the release said. Jaitley was accompanied by Chief of the Army Staff (COAS) General Dalbir Singh Suhag. On arrival, the defence minister was received by Lt Gen K J Singh, Western Army Commander, Lt General N P Singh Hira, Vajra Corps Commander and Maj Gen PS Sandhu, 'Panther Division' commander. Jaitley also visited headquarters of 'Panther Division,' where he was given a "comprehensive briefing" on the overall dynamics of Western Sector, including operational preparedness, the release said. CHANDIGARH: Forces deployed in the deserts of Rajasthan or in similar climes will soon be geared in body-cooling vests to improve their operational readiness. The Defence Institute of Physiology and Allied Sciences (DIPAS), Delhi, is conducting trials of these hi-tech vests before they are inducted for use in the defence forces. This climate armour can reduce hot and humid conditions by 10 to 15 degree Celsius. With the transfer of technology of the Man Mounted Air Conditioner System (MMACS) into a vest, the effect of unbearable heat can be significantly reduced. The US military used such cooling vests in Afghanistan. But, this is the first indigenous product developed for the defence forces as well as for the paramilitary by the heat physiology group at DIPAS. The vest works on the principle of Peltier effect, where the negative and positive terminals of an electric circuit have different temperatures. The negative side gets cold and any material that comes in its contact also gets cooler. Using this technique, air is filled in hollow tubes of the vest from the negative end (cool end), which cools the air inside. The tubes are enclosed in a perforated black vest that allows it to flow over the skin allowing the sweat to evaporate. "This works the same way as a perspiring person under a fan. The weight of the vest is not more than 1.5 kg, including a battery which is tied around the belt, and lasts for 4 hours," Abhishek Bharadwaj, a scientist at DIPAS, said. Field trials have been completed at Jaisalmer on Border Security Forces soldiers. "The results are being compiled and analysed before we set out to transfer the technology," Bharadwaj said. The DIPAS will later work on hot vests for troops deployed at high altitude. "It can be a spin off, using the same technique. We are working for the defence and the paramilitary forces. After getting their feedback, we will further improvise," Bharadwaj added.